Actor Park Seo-joon had a beautiful date with fans and created a new drink. On May 9, cool actor Park Seo-joon held a fan sign event at a cultural complex in Yeoido to celebrate the launch of new seasonal items from Gong Cha. Park is the brand model for the Taiwan-style drink shop franchise. 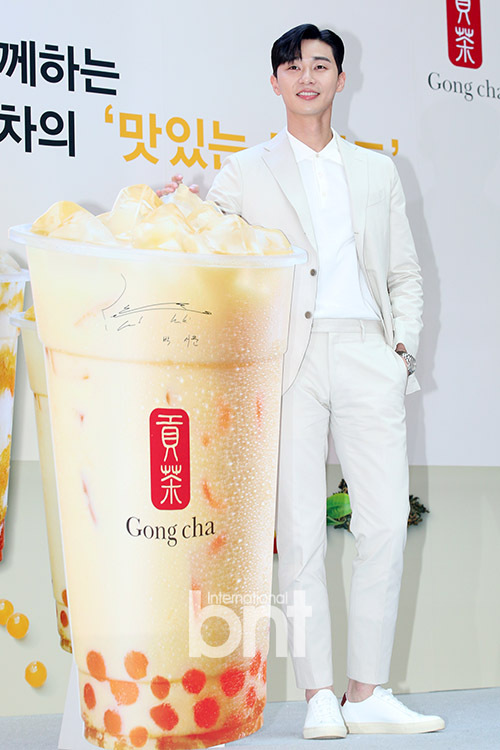 For the event, Gong Cha built a miniature studio where Park created his own seasonal beverage. Perfect for the hot and humid summer, the actor made the “Mango Jewelry Milk Tea” and showed it off to fans. Reportedly, Gong Cha designed the even to convey the brand’s philosophy of tolerance naturally. Further, it was also used to express the goal to continually innovate and introduce new products to consumers. Meanwhile, Park is working on the upcoming “Why Secretary Kim” based on the webtoon of the same name. Additionally, 2PM Chansung and Pyo Ye-Jin will also appear in the new series.